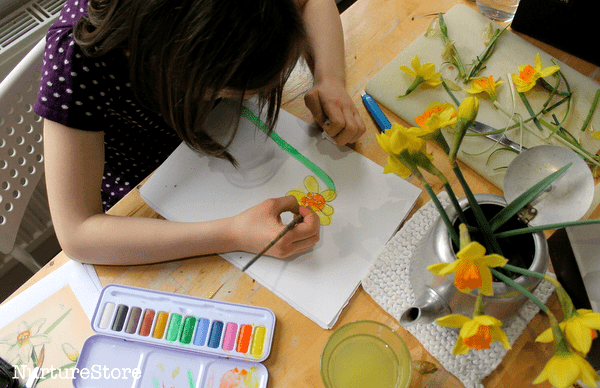 In this daffodil art lesson we will look at famous art featuring daffodils, learn about still life art, and create our own daffodil paintings. You can see the complete Daffodil Unit here. Let’s use our senses to think about the essence of daffodils and how we can interpret them in our own art. We’re going to use our senses to explore daffodils, and then use our paints to capture our impression of daffodils in a painting. What is a daffodil like? Let’s start by taking a good look at some daffodils. Take one of your flowers and look at it very closely. What colour is it? Look carefully at the petals and trumpet to see how many different colours and shades you can see. Hold the flower up to the window and look again at the petals. If you have a patch of spring sunshine, place the daffodil there and see if the sunlight changes the colour of the flower. What shape is it? What words would you use to describe the shape of the stem, the petals, the trumpet? Turn your daffodil around and look at it from different angles. 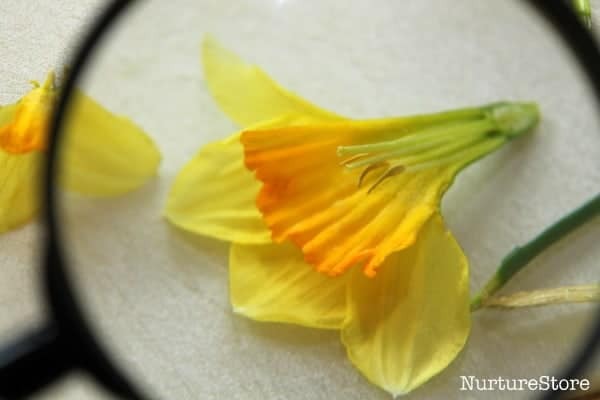 If you have a magnifying glass, take an even closer look at the petals of your flower. What can you see inside the trumpet? What does your daffodil feel like? Run your fingers along the stem. Squeeze them stem gently. Carefully rub the petals between your fingers. How does a daffodil move? Do you have some daffodils in your garden that you can watch? This film, made by Neil Bromhall, is a time lapse which shows how daffodil flowers burst open and how the petals unfold. Start to think about the essence of a daffodil. What is a daffodil? How can you paint your idea of what daffodil is? Let’s have a look at some famous art featuring daffodils. You’ll see that each art work looks completely different. There is no right or wrong way to create art: the artist is sharing with the world what they see. That’s what makes art so creative and special. You’re sharing your own view of the world. Remember this when you are painting your version of daffodils – your work will be unique to you. The art we’re going to look at are all still lifes. A still life painting can show man-made or natural objects, and often feature food, flowers, and other every day objects. Artists sometimes use still lifes to share a message about what they think is important, or to celebrate the beauty of life. They also often use still lifes to test out new techniques or styles of painting. 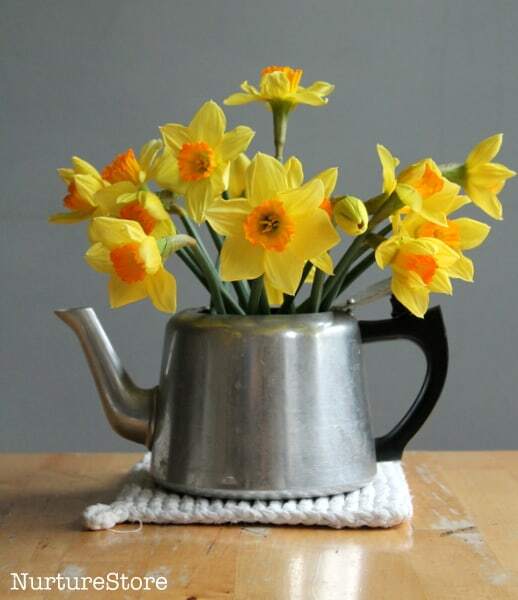 Now let’s create our own version of a daffodil still life. Think about what you saw and felt when you were investigating your daffodil, and how different all the famous art looked. 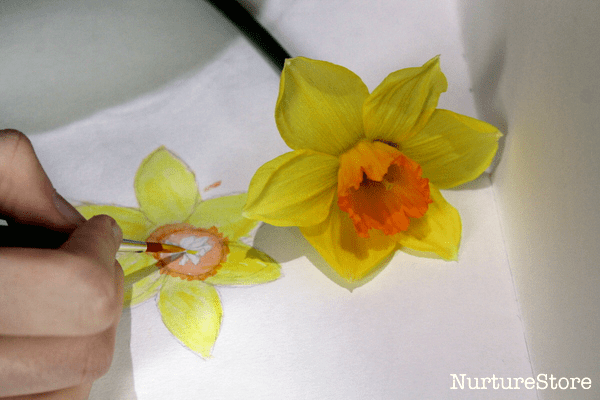 How will you paint your daffodil? Take a sheet of the watercolour paper and your paints. Are you going to create a single daffodil or a bunch of them? A whole flower or just a part of one? Are you going to copy the real colours of a daffodil or use other colours? You might like to sketch out your daffodil first with a pencil. You might like to just use paint. You could experiment with the watercolours, blending your own colours. You could paint on to dry paper, or wet the paper with water first and then add your paints on top. You’ll get a very different look, so test out both and see which version best matches your idea for your daffodil. You might like to listen to some spring music while you paint. The Four Seasons by Vivaldi is a famous piece of music which represents each season of the year through sound. Here’s a version played by the English Chamber Orchestra with Nigel Kennedy. Spring, la Primavera in Italian, comes first, for around 10 minutes, followed by the summer, autumn and winter. Hi Cathy, I just wanted to let you know I really appreciate your web site! 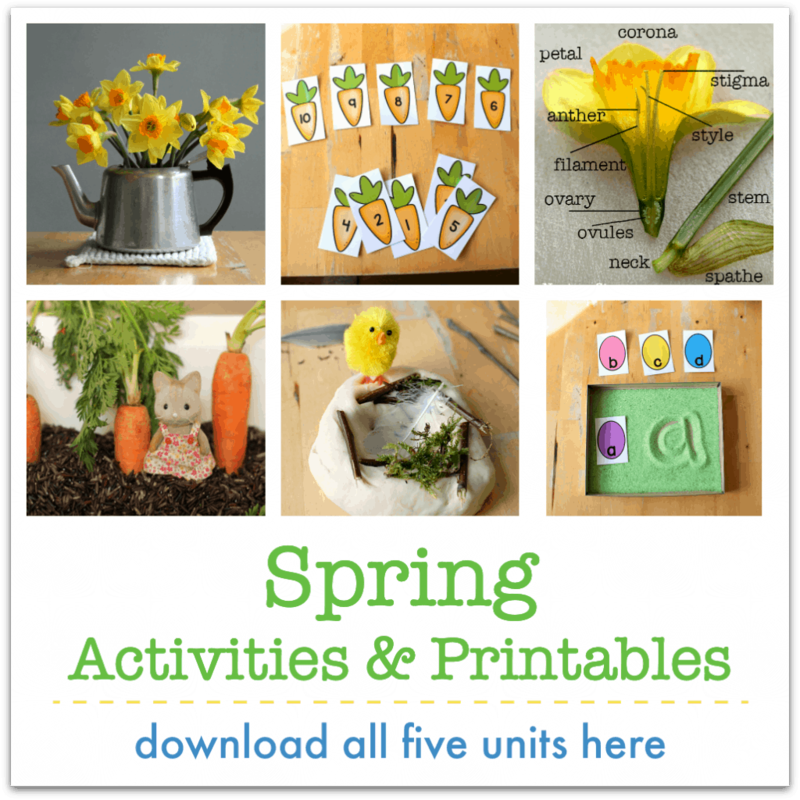 You offer wonderful ideas for teaching children in a creative way and also great links to articles and ideas. I am a former pre-school teacher and of mature age and I miss those days so much! Hoping for Grandchildren very soon! I will be using your resources for sure. Again…many thanks and keep up the good work. Thanks for the lovely feedback Susan.